Are you searching for a delicious, easy, homemade strawberry ice cream recipe? Here it is! Good, cold strawberry ice cream! Yes! Chop 1/2 cup (125 mL) of the strawberries into 1/4 inch (2/3 cm) diameter cubes. Place the remaining strawberries into a blender and puree them. Next, gently mix together the pureed strawberries with the lemon juice and the sugar, then allow the mixture to rest in a refrigerator for 30 minutes. After the 30 minutes have passed, remove this mixture from the refrigerator and gently mix in all of the remaining ingredients (except the cubed strawberries). Finally, pour this ice cream mix into an ice cream maker and process the ice cream as instructed by the ice cream maker's manufacturer, adding the cubed strawberries just as the ice cream begins to thicken. Makes about 2 quarts (2 L). It's just that simple to make your own ice cream! 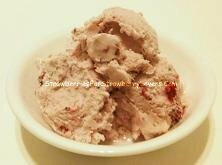 Please remember that you found this easy recipe for homemade strawberry ice cream here at StrawberriesForStrawberryLovers.Com, Home of the World's Happiest Fruit!